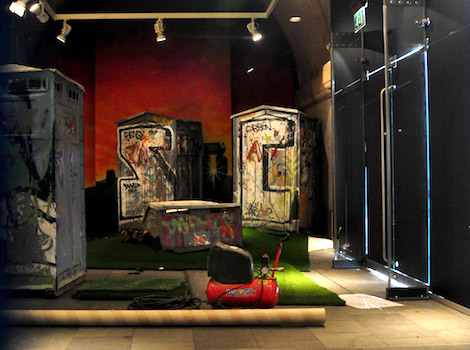 Thanks to twitter users, the location of Banksy’s Summer Show in Bristol 2009 has been discovered. It will be taking place at Bristol’s City Museum on Queen’s Road, with a private viewing on 12th June and public viewing from 13th June 10am (usual museum opening hours 10am – 5pm). There has been no official press confirmation of this information yet, but I went to the museum this afternoon and managed to take the above photo through a small gap in the front doors. Clearly something street art related is being prepare in there. 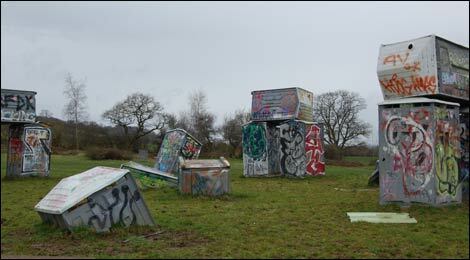 The photo below shows a portaloo sculpture by Banksy in 2007 at Glastonbury. These look very similar to the ones photographed above. More proof needed?